For Maximum performance and longevity, no other remote-control irrigation valve can compare to the self cleaning Griswold 2000 Series valves. 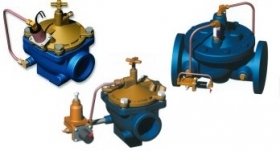 The unique design allows the 2000 series valve to serve dependably under the most adverse conditions. Sludge, algae, silt, and other contaminants have no effect on the valve action. There are no filters or screens to clean or replace. Instead, the mechanism cleans itself each time the valve opens and closes- smoothly and quietly. The same mechanism is designed for absolute control over the speed at which the valve opens and closes. There is never any water hammer or chatter that can damage pipe joints and other sensitive parts of the irrigation systems.